New Liturgical Movement: If There Is An Antichrist, Is There An Antimary? This is the title of an article by Dr Carrie Gress which appears in the National Catholic Register, and caught my eye. I met Dr Gress last year at the Acton University where she gave a talk on faith and culture and the current discussion about the “Benedict Option.” (She and I are both speaking there again this coming June). In her talk last summer, she discussed both Alistair McIntyre’s use of the phrase in the closing paragraphs of his book After Virtue, and how it has caught on recently after an article by the journalist Rod Dreyer picked up on the theme. At the end of her talk, Dr Gress suggested that an alternative to the Benedict Option which she referred to as the Marian Option, a focus on devotion to the Mother of God might lead us into that cultural renewal that is sought by so many. I immediately thought of the parallels with Cardinal Burke’s recent promotion of the re-establishment of men’s Holy Leagues, which played such an important part in the call to arms in defense of Christianity in the 16th century, and are intended today to promote a Marian chivalry as part of engagement with modern, secular culture. The crystallization of this idea will be realized in her book The Marian Option: God’s Solution to a Civilization in Crisis, which will be published by Tan Books in May. As an aspect of the focus on Mary, Gress’ idea of the Antimary as articulated in this recent article resonates with me after watching and seeing accounts of the recent women’s march in Washington D.C., to which she also refers in her article. My personal reaction to this is that devotion to Mary draws us to Christ, and so to the personal transformation that is necessary in each of us if we are to become agents of change in the culture. It brings to mind Bl. Pope Paul VI’s Marialis Cultis: Apostolic Exhortation for the Right Ordering and Development of Devotion to the Blessed Virgin Mary from 1974. In it, the Pope describes a hierarchy of devotions to Our Lady in which all point to an approach to Jesus through Mary, especially through the feasts in the liturgical calendar. When our devotion to Mary leads us to worship of the Father, through her Son in the Spirit then our Christian life is well ordered. Furthermore, as someone who is interested in the place of sacred art in the liturgy, I would love to see a more widespread practice of engagement with art during the liturgical celebration, in a way that seems more common in the Eastern Church. I am always struck in Byzantine liturgies how all turn and face the icon of the Mother of God whenever her name is invoked. If this were to become more widespread, it would probably improve both our prayer and our art! 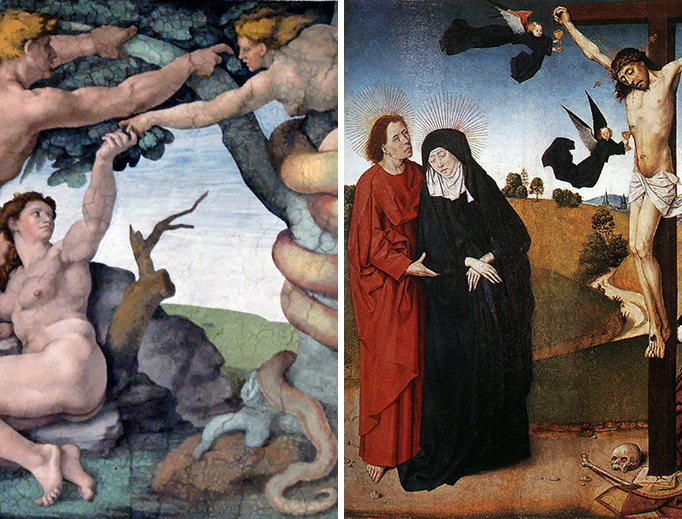 What, then, would an antimary movement look like, exactly? Well, these women would not value children. They would be bawdy, vulgar, and angry. They would rage against the idea of anything resembling humble obedience or self-sacrifice for others. They would be petulant, shallow, catty, and overly sensuous. They would also be self-absorbed, manipulative, gossipy, anxious, and ambitious. In short, it would be everything that Mary is not. So many sacred images of Mary depict her leading us to her Son. 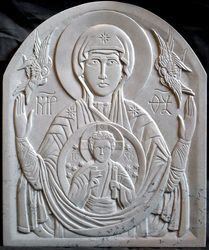 Perhaps the image in which the connection is most profound is the Mother of God of the Sign, in which to see her is to see the image of the Son. The image below is of a relief carving by Jonathan Pageau. Dr Carrie Gress is on the faculty of www.Pontifex.University. Her online introductory philosophy course, a History of the Transcendentals will be offered early in the summer.